Size: Tooth is 4 inches long! 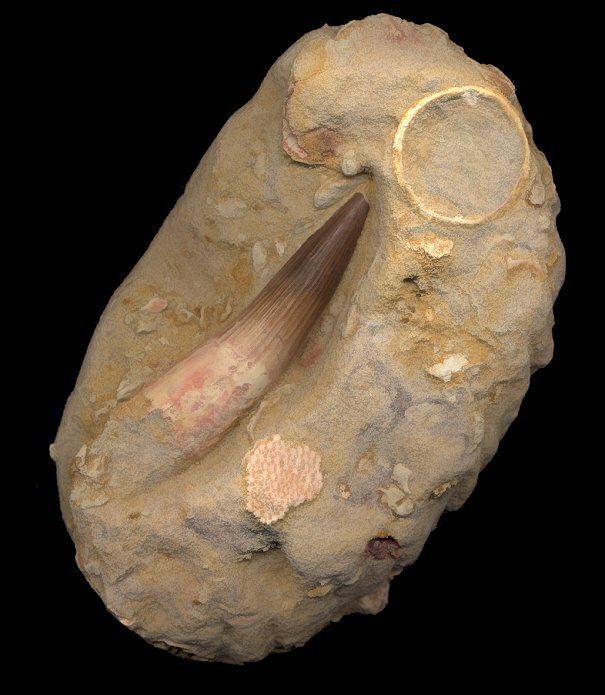 This is an amazing dinosaur tooth in matrix. It is a HUGE Spinosaurus aegyptiacus tooth from the Cretaceous of Morocco. It is extremely difficult to obtain dinosaur teeth from Morocco in the original matrix. This LARGE tooth (a full FOUR inches long!) is 3-dimensionally preserved in the unbroken matrix plate. The corrugated enamel of the tooth is easily seen, and the LONG root is even preserved on the tooth. The reddish-brown color of the tooth contrasts nicely with the sand-colored rock that also contains a large shark vertebra and other vertebrate fossils! And THE TOOTH IS FULLY NATURAL TO THE PLATE, NOT ADDED OR COMPOSITED! This is a very collectible and extremely rare matrix tooth from this giant, carniverous dinosaur.